Thrill your palate with these special truffles - a myriad of tastes ranging from fine brandies, rich butter crunch, subtle fruit ganaches, hearty nut fillings and sumptuous caramel will envelop your senses. The light texture of the ganache fillings will delight you because Teuscher uses only the purest, highest quality ingredients free of preservatives, hydrogenated oils, gums or waxes. 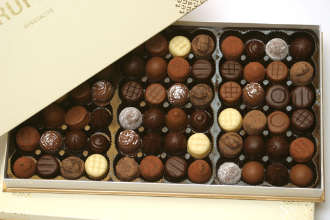 These chocolates are made to order and shipped directly from Zurich to ensure the utmost freshness.